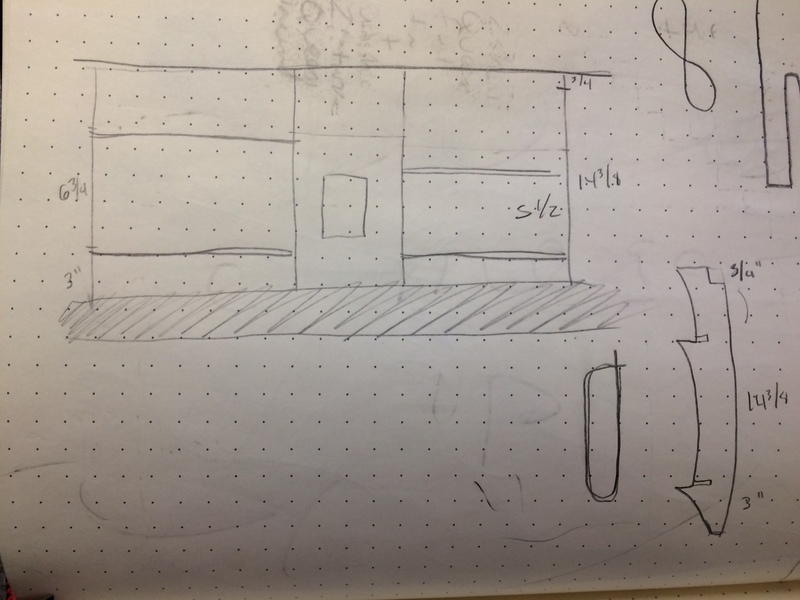 I recently posted an image of some shelves I built on instagram, and there was enough interest I though I would post a how to and the files in case anyone wants to make their own. 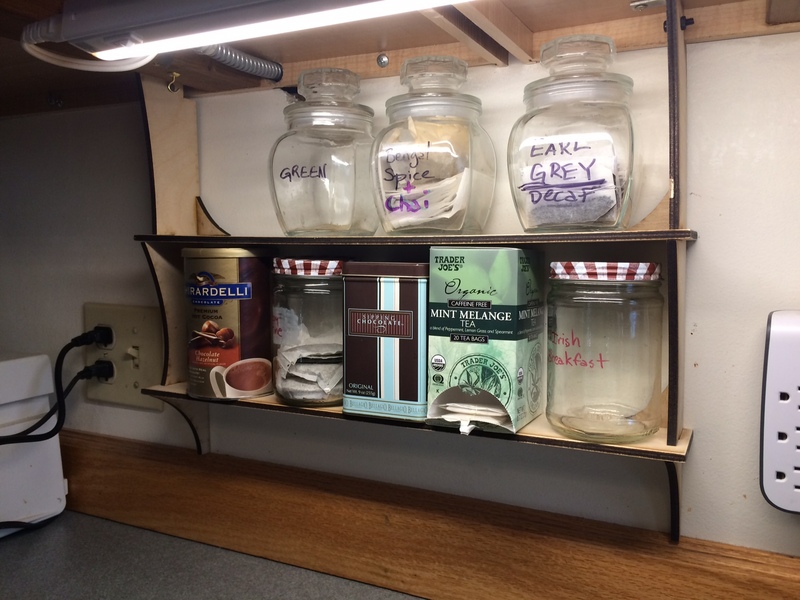 These shelves require only a short screw or two into the bottom of your cabinet where it will not show, making them good for renters who can’t attach things to the wall. Drill with drill bit big enough to make hold for bolt to pass through. Laser cutter with a bed big enough to fit the largest dimension of your shelf. Ready for your customizations, this will require you to copy and paste the support and shelf once you’ve adjusted. This is included as an example of optimizing the cuts and splitting over several files to fit on a smaller bed. It is doubtful these files will work as is, you’ll need to adjust them to work in your home. The notch you’ll need to make at the back of the shelf (see picture below, bottom right) so you can check and see if yours is big enough. Jot all these dimensions down before you start working with the file. If you’re working at a maker space, they probably have adobe illustrator there, but you’ll want to make sure you have carefully measured everything before you get there. You can also get a free trial of the software through adobe. Sorry, I can’t help transfer these files into other formats, but if others want to they can contribute them back to the github repo. If you want, you can cut the pieces out of cardboard to visualize how the’ll look in your space. I did this before I made the first set to make sure they would look OK. Consult with someone at your maker space for instructions cutting your shelves. Every laser cutter is different, so I can’t be a ton of help there. It may take several passes to cut through all your wood. Be very careful not to move your piece until you have determined it is cut all the way through. Some laser cutters never cut all the way through in places. In this case, you may need to take a sharp knife to the back to get the piece all the way out. You’ll probably have to change the stroke width of the shapes to .001, but check the instructions for your laser cutter. I left the files with a larger stroke because on some computers, the file appears blank when set to .001. Sand all your pieces before you fit everything together. This is annoying, but makes a huge difference. Hold up each support where it will go, and make sure it fits. You may find that the bottom support is too long–you need to file or sand it down until the fit is perfect. If you made it too short, you can glue a small piece of something (cardstock, cardboard, a small sliver of wood or rubber, several tiny pieces of duct tape, whatever works) to the bottom until it fits well. If the notch for the cabinet support isn’t big enough, you may need to file that. Once you have everything down, fit the shelf together and check again to make sure it fits. Then, glue the quarter round pieces under the shelves like so for a little additional support. I just used wood glue here and held each piece in place and then allowed it to dry for a while. If you want to make sure it’s extra strong, you may want to clamp them in place while it dries. After the shelves are all done and the glue is dry, you can spray paint them. I haven’t done this step yet, I’m waiting till the weather is warm. 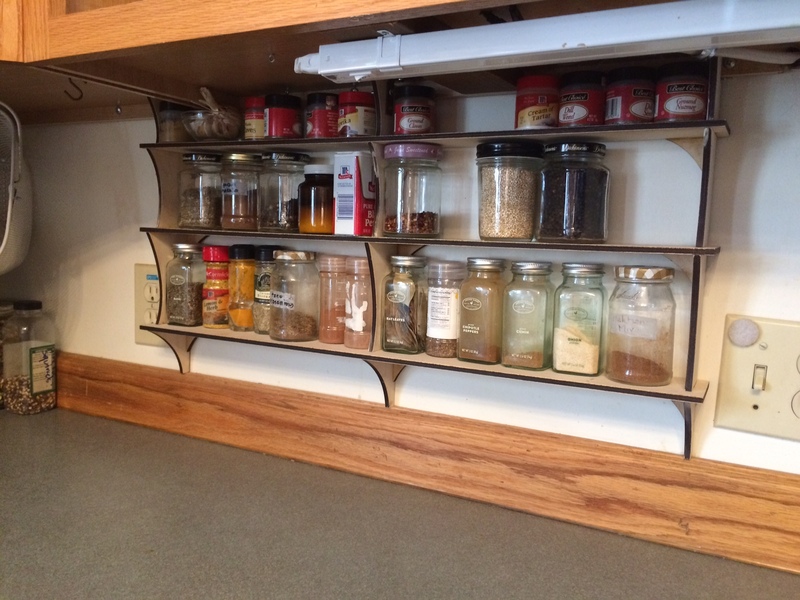 The shelves are held in place via L brackets screwed into the bottom of the cabinet. Make sure you use very short screws for this, or else they will poke up in the bottom of the cabinet. 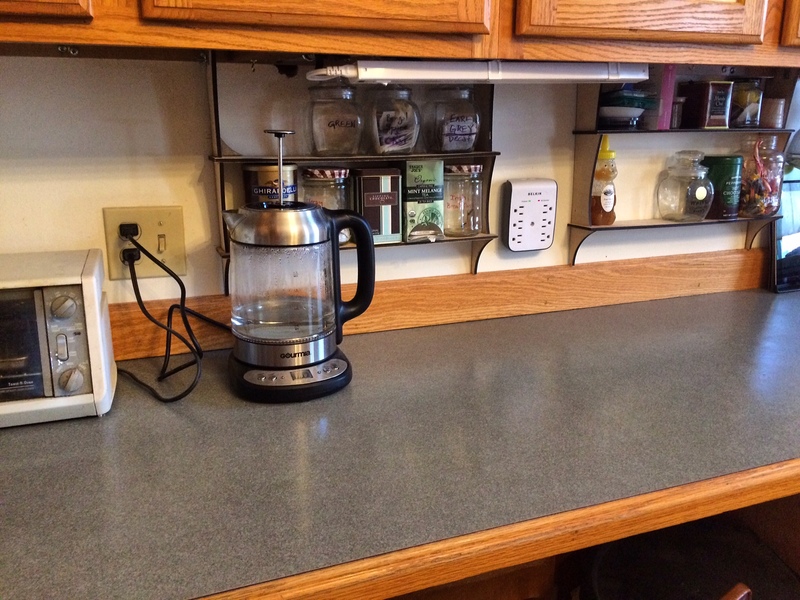 For this step it’s useful to have someone hold the shelf up while you mark everything. Place the L bracket where you want it to go and mark the holes in the bracket. For the three support shelf, I’ve found it sufficient to only put a bracket on the middle support, but for the two support shelf, you’ll probably need one at each end. Next, use your (short!) screws to attach the L bracket to the underside of the cabinet. 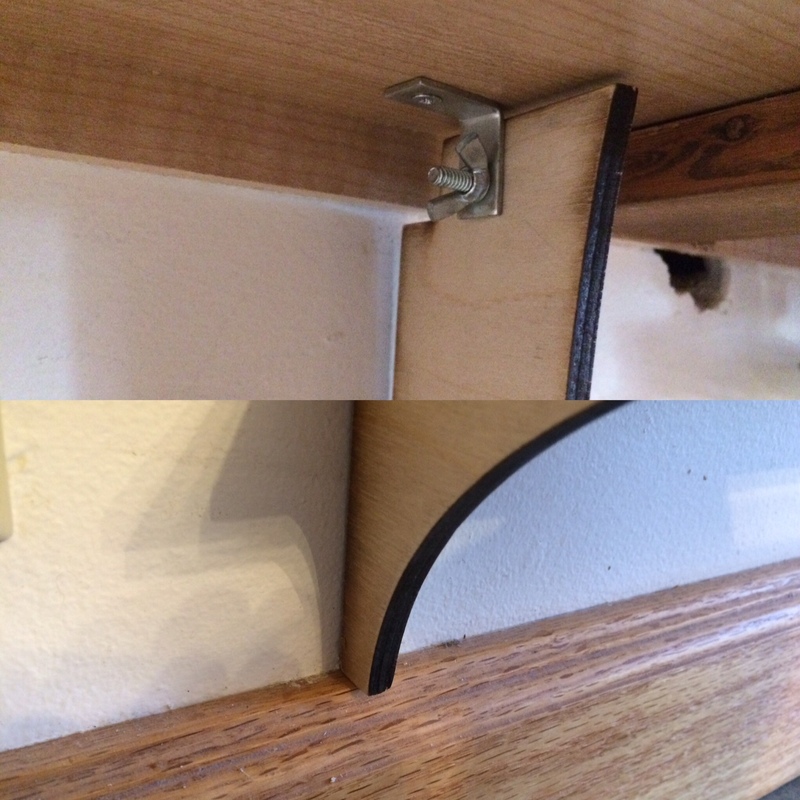 Use your mark on the shelf to drill a hole big enough for the bolt to pass through. Then, you line everything up, put your bolt through the shelf and L bracket, and tighten everything up. The links to these files point to a lasercut_shelves github repo. If you’d like to contribute files or have me link to yours from the repo, do a pull request (with new files or to a link from the readme.md) if you know how or email me at karin@nirak.net.